In the mid 70s, The Hudson Brothers were billed as pop music's answer to the Marx Brothers. With moderate record sales and their own Saturday morning variety series, The Hudson Brothers became cover boys for both "16" and "Tiger Beat." Although their music was solid, well-crafted pop music, the Hudsons connection to the teen world did more to hider their career as musicians than help it. they did have some chart succes with the singles "Rendezvous" and "So You Are A Star" (written by Mark for Bill Hudson's then wife, Goldie Hawn), they were virtualy boycotted by FM radio. 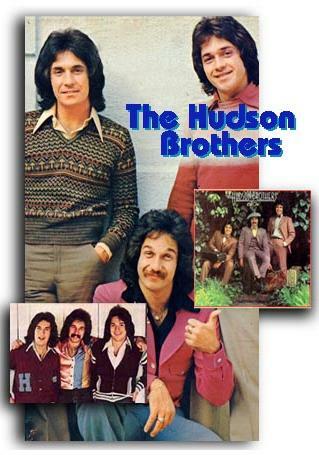 Although they were older and noticeably hairier than most of their contemporary idols, The Hudson Brothers were very popular with readers of the teen publications, and remained popular well past the Bicentennial. Brett, Bill and Mark Hudson have all appeared as backing vocalists on many LPs both credited and uncredited. Bill Hudson although divorced from Cindy Williams (of "Laverne & Shirley"), together, they owned a production company and were resonsible for producing both of the "Father of the Bride" movies. They also appeared together in an infomercial for healthy dog chow in the late '90s. Mark Hudson is a noted sonwriter producer and musician. He wrote "Living on the Edge" for Aerosmith, and songs for Hanson on their "Middle of the Road" CD. He also has toured with Ringo Star and his All Star Band in 2005. Heartthrob of the group, Brett Hudson has a little less hair than he did in the '70s, but is still charming as ever. He is currently working in television production, and has several projects in development.  Bill's daughter is Kate Hudson who appeared in the movie "Almost Famous." Kate's mother is Goldie Hawn.  The Hudson Brothers wrote and appeared in a 1983 film called "Hysterical"
 John Lennon called his friends the Hudson Brothers "the Kings of Saturday morning"